This is a unique multi-currency trading strategy developed for trading on H1 timeframe, which allows you to determine the global market entry points and obtain the maximum profit for each transaction. 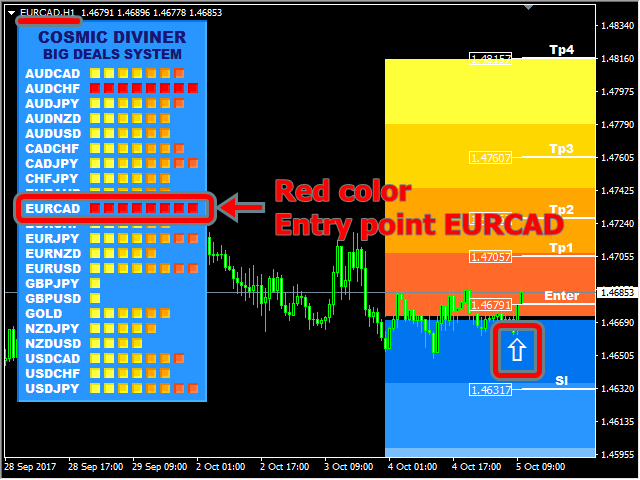 The market entry point is calculated using a variety of author equations and algorithms. 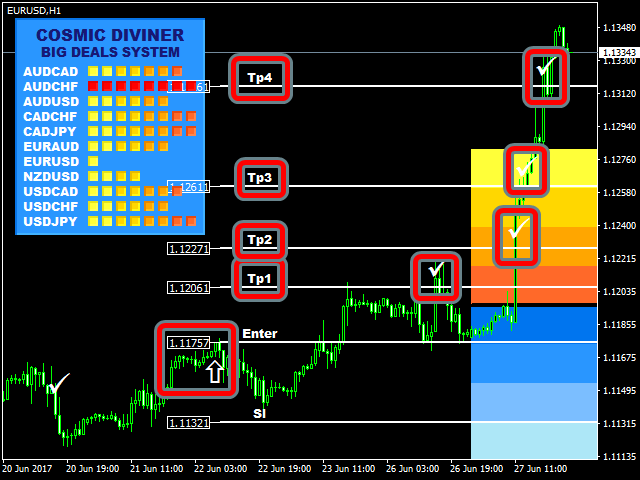 We recommend using the indicator simultaneously on several trading instruments. A huge advantage of Big Deals System is an information panel in which the user can see the current information on potential entry points on all trading instruments, on which the indicator is installed, simultaneously. After the indicator is placed on the chart, you can see name of the symbol and the histogram (in the form of a gradation from 1 to 8 squares) appear in the information panel. For visual convenience of the user, the histogram is painted in colors from yellow to saturated red. When all 8 squares of the histogram are painted red, this signals that an entry point to the market has appeared on this trading instrument. Conversely, if the histogram is displayed as a 1 yellow square, it signals that there are no entry points on this trading instrument. 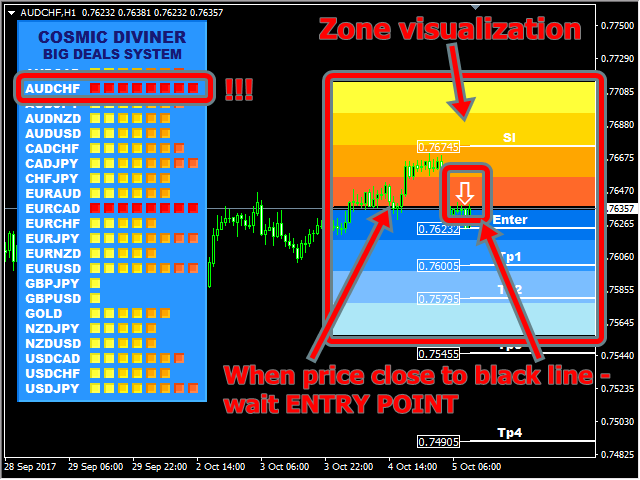 Also, on the price chart, you can see Zone visualization - the visualization of zones in the form of a heat map, the closer the price approaches the center of the Zone visualization marked as a black line, the greater the probability of an entry point to the market for this trade instrument. The user needs to wait for the corresponding arrow to appear on the Buy or Sell order. The Big Deals System is equipped with a dialog box, in which you can get up-to-date information on entry points, Stop Loss installation and achievement of the Take Profit price level, and optionally you can connect sound information. The profit levels (TP1, TP2, TP3, TP4) are automatically calculated for each trading instrument, on which the indicator is set, depending on its volatility and previous fluctuations using author equations. 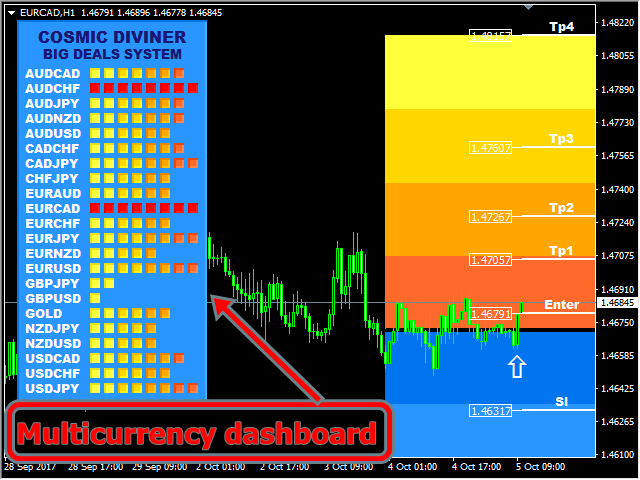 Color of your background (Dark/Light) - background color of the chart. Alert and sound (True/False) - alert and sound. Zone visualization (True/False) - visualization zone on the chart in the form of a thermal scheme. The closer the price is to the central black line, the greater the probability of the appearance of an entry point for this instrument. 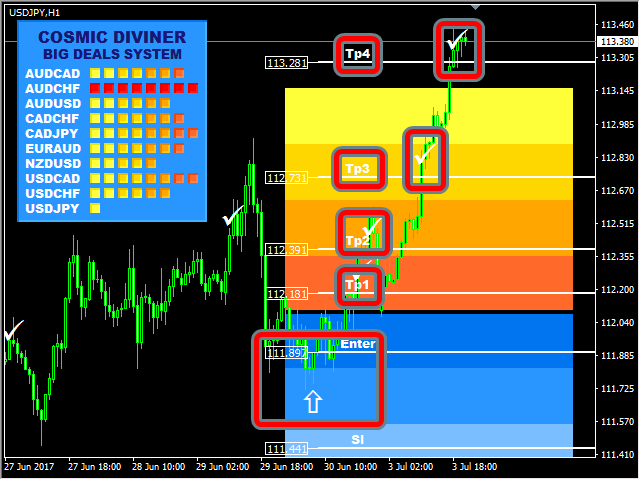 The Cosmic Diviner Big Deals System indicator is never redrawn. Level SL - recommended Stop Loss level is indicated on the chart as a horizontal line with a price tag. For trend trading this is one of the best indicator but you need to gauge the trend and know which pairs to use. Still one of my favorite indicator. Thanks !!! It can be useful to scalp using this indicator. Mainly for H1 timeframe. 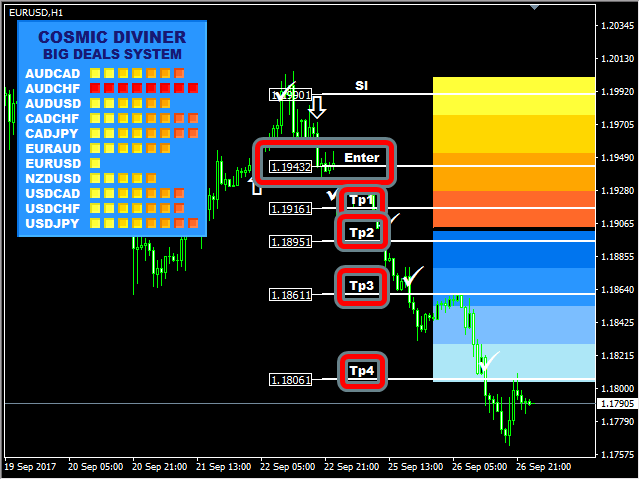 Useful to entry if you use multi timeframe. Super thumbs up. very usefull indicator. good enrty points, solid profits. 1. Added ability to move the Information Panel of the indicator. Added visualization of previous trades.